Continuing with our presentation of MJ Crafts Design Studio's St. Valentine's Day and Easter Season handmade crafts, we wish to introduce additional, unique crafts for these two seasons. Remember, as I mentioned before, now is the time to order, as we will be retiring from the military and moving back to the states. Our household goods will be in transit, so for a month or so Mary won't be able to process new orders. Dimensions: From 1.75 h - 2.75 hDescription: Handmade with glazed Fimo and large paper clips. Functional, colorful, funny and durable.Make everyone laugh with these unique gifts! 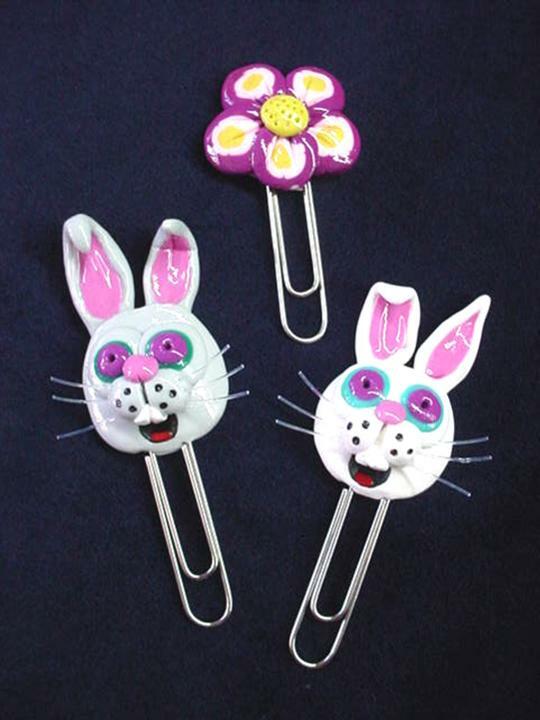 Perfect for Secretaries Day, Church groups or "Back to School" gifts. These are but some of the additional funny and unique handcrafted gifts at MJ Crafts Design Studio. Don't forget to use the Sitemap and the Sitemap2 to help you search and navigate if you have specific crafts and gifts you are looking for. Also, we are always looking to link up with quality Arts-Crafts-Gifts sites which could be of interest to our visitors. If interested. check our Arts-Handmade Crafts-Gifts Related Sites Directory and submit your site. As always, it is a pleasure for us to have you as a visitor! All Handmade Crafts, Handcrafted Gifts and Decorated Eggs Art at MJ Crafts Design Studio - Featuring the Eggypiece Art Collection, beautiful and funny FIMO Polymer Clay creations, and many more 100% handmade crafts made out of ceramics, porcelain, wire, beads, and polymer clay. Very unusual! PayPal and Family Friendly. Come and Visit Us!